the rabbit's project was brought to us in an enveloppe. All we got is that diaporama you'll be watching and a note with something on it that looked like a poem ? 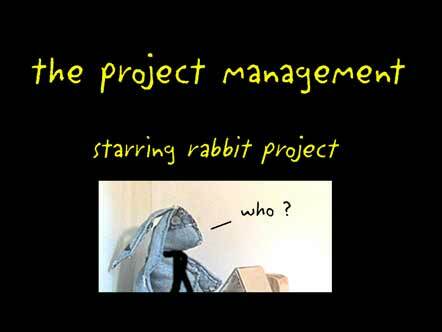 These clues tell us this guy was some sort of a maniac, with project management tendancies. Wether it was an ingeneering project or a construction project is not very clear, but what is sure is that it was some of those funny project they show people in mad houses. So we called it the "mad project", and began cross managing stuff. but it's closed - damnit !!! by jove, he peed on the budget !! Hey, is it true that if I to the rabbit, I get a funny quote and a comic strip a day ?